The term “Membrane Switch” is a vast category of methods of switching, or activating, an electrical pathway. That pathway could be a thin sheet of polyester or as thick as a printed circuit board. How is a membrane switch made? The interface layer plays a critical role in a membrane switch as “aesthetic value will often be important to consumers for durable products, as these products are often used for many years” (Creusen and Jan 15). Imagine wanting to purchase an expensive stove or oven; an appliance that you might be interacting with daily. Once you have narrowed down your choice by features the next question is: does it look good? The interface layer of a membrane switch is what all of the end users will be looking at and working with. 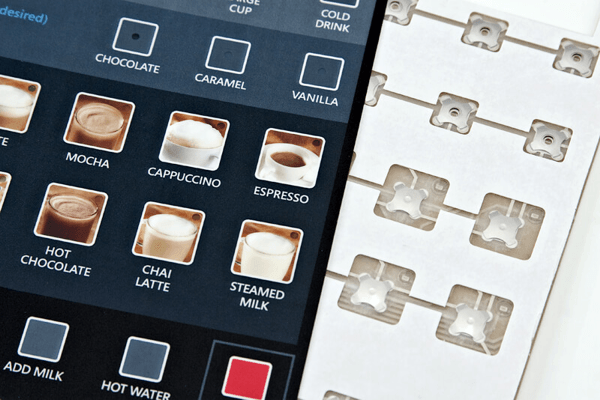 There are a few different choices on the interface layer such as, rubber keypads, capacitive switch overlays, or graphical overlays. The switching layer is the second most important layer. After the user looks at the product, their next action will be to interact with it. There are three primary options for switching methods: steel domes, polyester domes, mechanical switch, and capacitive switch. Each method has a different tactile feel and plays a role in how a customer perceives value in a product. We dive into the math behind tactile feel and the Snap Ratio in our rubber keypad design guide. Finally, the adhesive layer. Different environments need different adhesives. Some switches will be exposed to salt spray, high humidity, and sunlight. Where other switches may be used in a desert with high heat and dust. Membrane switches need to function through these environmental trials. There are many different customization options for membrane switches. On Monday we took a detailed look into backlighting methods; however, customization does not end there. 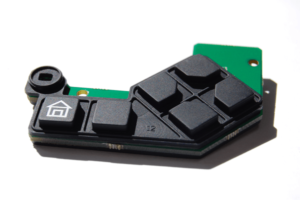 Membrane switch components can include; metal panels, LEDS, connectors, electronics, printed circuit boards, ESD protection, light blocking, and much more. Each option helps build on the aesthetic value and add additional functionality as we discussed earlier. Finally, one needs to consider specifications and requirements. We touched on the subject of FDA requirements last week in our article on “Why the Medical Device Industry Continues to Embrace Membrane Switches”; however, requirements could also include ingress protection ratings (IP ratings). IP ratings define the degree of protection that a device has against external intrusion from things like: dust, water, or body parts. How is a membrane switch made; membrane switches can be made in may different ways but the basic concepts: interface layer, switch later, adhesive layer, customization, and specifications all remain consistent. Sigma 6 Electronics has been building membrane switches for over 10 years and can help with any custom membrane switch application, contact us for a free design consultation or quote. Creusen, Marielle EH, and Jan PL Schoormans. “The different roles of product appearance in consumer choice.” Journal of product innovation management 22.1 (2005): 63-81.